Now enjoy the great features of a MaxxAir brand fan outdoors! A must-have for cooling outside on the patio during scorching temperatures, or inside to offer a steady breeze in large spaces. 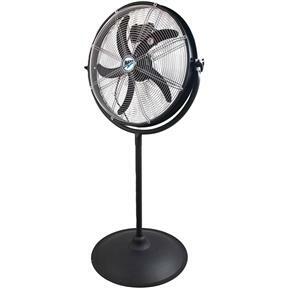 Our 20" Pedestal Fan is quick and easy to setup with just a screwdriver needed to complete assembly. Once it's ready to go, enjoy three speed settings for customized cooling with a pull of the chain. Constructed of resistant metal materials, the outer shroud housing helps to concentrate airflow outward towards you, while the tilting fan head makes sure you can point the airflow exactly where you need it. When you're done, use the built-in cord wrap on the back grille to make sure your power cord is safely out of the way! This unit is equipped with a GFCI plug and OSHA approved metal grilles for added safety. we bought one liked and enjoyed it so much we got two more for our children. good product!